Available at Barnes & Noble, Amazon.com, and most major online bookstores. "I got a real kick out of reading it. It is a good send up of the conventional wisdom, and also an insightful discussion of some real wisdom. Congratulations."  John C. Green, Director, Ray C. Bliss Institute of Applied Politics, University of Akron. the "presidential champion" of predictions by MarylandReporter.com. and the "professor who has predicted 30 years of presidential outcomes correctly" by the Washington Post. To see a presentation about the book by the author, visit YouTube. A Post writer even said Lichtman's system is fool proof, a claim pondered in Chapter 16 of this book. In the early 1980s, Lichtman, a history professor at American University in Washington, D.C., looked back at all presidential elections in the history of the current two-party system, that is back to the Civil War. He systematically isolated circumstances that are typically present when incumbent party wins. Applying them forward, he has an unmatched record of predictive success. In the elections of 2004, 2008 and 2012, among others, he predicted which party would win presidency before the election year even began and the nominees had been determined. In 2004, tiny leads in the polls went back and forth between the candidates all year; most political pundits saw an uncallable race in which the outcome would depend on the campaign. Then 2008 saw the first black president elected after two years of national hand-wringing about whether such a historical event was possible. The 2012 election was likewise seen universally as up in the air, especially after a widely trashed performance by President Barack Obama in the first debate. But Lichtman had said in 2010 that the enactment of Obamacare "nearly guarantees" an Obama victory, a view that directly contravened ALL conventional opinion. In all three races, Lichtman saw that the decisive forces at work were circumstances much bigger than campaign events. 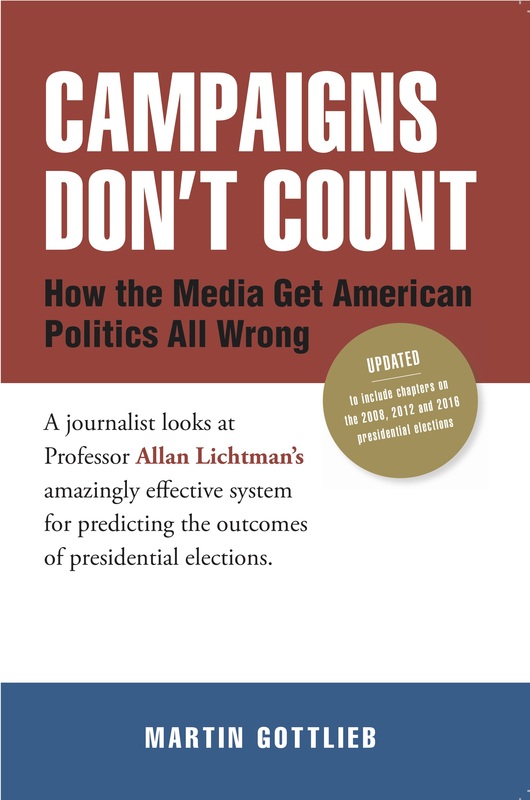 In the late 1980s, Martin Gottlieb, as an editorial writer and political columnist for the Dayton Daily News in Ohio, was floored and fascinated by Lichtman's unparalled successes in predicting senatorial election outcomes. Gottlieb began what became career-long coverage of the record of the Lichtman "keys." That resulted in a 2006 book with this title. At hand now is an update, with new chapters on the three subsequent presidential elections. What emerges from Campaigns Don't Count is not primarily a way to win at the game of political predictions, but a new understanding of how American politics works, of what drives presidential election outcomes. Hint: It is not campaigns, media manipulation, money, political organization, ideology or any of the other forces which the media and the "experts" who advise them - focus on. Martin Gottlieb retired from the Dayton Daily News in 2011 after 27 years with the editorial page. For part of that time, his columns on national affairs were distributed by Cox News Service and appeared in newspapers across the country. In 1997, he was named Best Columnist in Ohio by the Society of Professional Journalists. In early 1987, I came across a magazine article reporting that a certain historian had predicted in writing before the 1986 election that the Democrats would take control of the U.S. Senate that year, which they did. I was fascinated because I had been following the campaign closely as a political columnist for a newspaper, and I hadn't seen anybody make that prediction (except a partisan Democrat or two). I checked out this historian's system for making predictions and found it fun and easily usable by the lay reader. Then I watched closely in 1988 as he confidently predicted in the May issue of a monthly publication that George H.W. Bush would win the presidency. Like most pundits, I was certain he was wrong. Bush had been running way behind in the polls all through late 1987 and 1988. I wrote a column about why and how the predictor was going wrong. But he turned out to be right. And, contrary to a zillion other predictions blithely made by journalists and politicos when Bush started to make headway, it wasn't even close. This predictor, Allan Lichtman, was simply alone in calling it early. I followed his record through the next two decades plus. This short book is the result, a record of success after success at the presidential level and a remarkable hot streak at the senatorial level, a streak that came to an educational end. I also checked out the records of other prediction schemes, both serious and fanciful. Lichtman's stood out. The whole experience was an education in how American politics works. After all, if accurate predictions about a presidential election can be made early (sometimes as early as January, even in elections that are then nip-and-tuck in the polls all year, such as 2004), what does that tell us about the importance of events that take place during the campaign: the debates, the television ads, the campaign shake-ups, the selection of running mates, the selection of strategies as to which states to focus on? What does it tell us about the importance of scandals that emerge or other embarrassments, or about changes in the economy or the world scene? About the usefulness of an "October surprise"? What does it say about polls and about the insights of the supposed "experts" whose job it is to explain American politics over the airwaves and newspapers. What does it say about the role of "issues," meaning disagreements over policy? Most important, what does it say about the forces that really do drive American democracy? Fred Barnes wrote the May 4, 1992 cover story in The New Republic, a magazine for political sophisticates: "Loser: Why Clinton Can't Win." It needs to be paused over here, not because it is one more mistake, or because there's any point in picking on Barnes. The special value in his piece is that he presented it not merely as his view, but as the view of the insiders, the people in the know. It is a remarkably well researched piece, if you consider talking to political insiders to be research, which, of course, by the standard rules, it is. The list of people he quoted and paraphrased as agreeing with him is impressive. Another passage: "Tubby Harrison, the pollster for Paul Tsongas this year and Michael Dukakis in 1988, has called Clinton 'a dead stone loser' in the fall." In this passage, Barnes notes that loser Dukakis jumped ahead of Vice President George Bush in the polls when he reached the point in the primaries where he clinched the nomination. Clinton didn't. Barnes quotes respected Republican pollster Richard Wirthlin saying, "A candidate can't get on the playing field unless he pays the ticket of honesty and integrity." And an unidentified "Democratic strategist:" "Once Clinton's negatives are established and allowed to grow deeper and deeper, they're almost impossible to blow away." Barnes unearths a Clinton problem beyond the usual list: low turnout in the Democratic primaries. He quotes former Sen. Paul Tsongas (a candidate in the early primaries) and then Georgia Secretary of State Max Cleland (later a Democratic U.S. senator), not to mention Bush's Southern coordinator, plus academic turnout expert Curtis Gans on the difficulty that low-turnout poses for Clinton. Barnes notes that blacks turned out in smaller numbers in the 1992 primaries than in 1988 (when the Rev. Jesse Jackson was in the race), and says, "I can't imagine how Clinton will lure them in the fall when he couldn't in the spring." Barnes concludes, "Absent a (Bush) scandal or economic collapse, Clinton's a goner." There was no scandal, and the economy improved. This is a print-on-demand book, not available at most physical bookstores, though they can order it.